Tonight and Tomorrow: A clear and cool night ahead, but temperatures will only drop into the 40s around midnight. Lows are only set to drop to around 44° into the early morning hours. Winds will calm tonight, and stay easterly and light into Sunday. High pressure continues its slow retreat to the east, but keeping its grip on the area for one more day. Sunny skies and warming conditions will allow for highs to reach around 70°. Clouds will begin to slowly build late in the day, as less sinking air, associated with the high pressure, is present in the atmosphere. 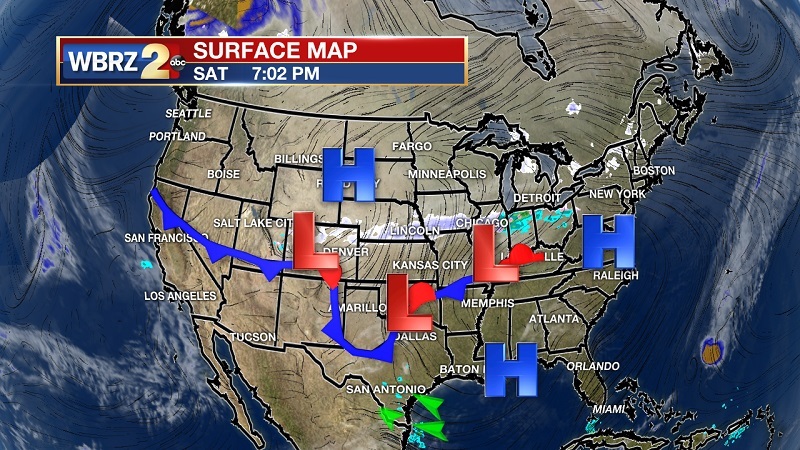 Up Next: As the high pressure travels toward the east coast, our protection from clouds and showers also departs. Clouds will start to build late Sunday, and partly to mostly cloudy skies are in the forecast through the workweek. This cloud cover is associated with several shortwaves that will keep light moisture passing across our area. The first wave is set to pass Monday through Tuesday, with another late Wednesday and Thursday. Spotty showers begin to lessen as we proceed into the weekend. The Tropics: A low pressure system located a couple of hundred miles northeast of the central Bahamas is producing winds to near gale force and an area of showers and thunderstorms. This system is embedded within a large scale frontal zone, and additional development is not anticipated. The National Hurricane Center is forecasting a 0% chance of formation within the next 5 days. The high pressure that has slowly moved across the area is breaking east and away from the region, and taking its sunny and pleasant properties with it. That will open the door to several shortwaves that will develop off the Texas Coast through the week. The first wave will have limited moisture travelling with it, and will only bring spotty showers late Monday and Tuesday. The second wave is more substantial, and should bring with it more rainfall and a potential for strong storms to develop. The majority of the wave will stay offshore, but the GFS model is suggesting that some cells could push onshore to travel west to east along and to the south of the I-10 corridor. High temperatures will be slightly cooler through the week, dropping into the mid-60s Tuesday through Thursday. Clouds are set to linger Friday and into Saturday, but showers will begin to taper off as we head into the weekend. Temperatures will also elevate, with highs breaking into the low-to-mid 70s and lows in the mid-50s by Saturday.